Each day I've been pretty good at making work the first priority so there's daylight left when I'm done. On Thursday and Friday after work, I took evening drives into surrounding Chillicothe farmland, where cows graze over rolling hills. The cow pictures didn't come out, but here's three others I like. 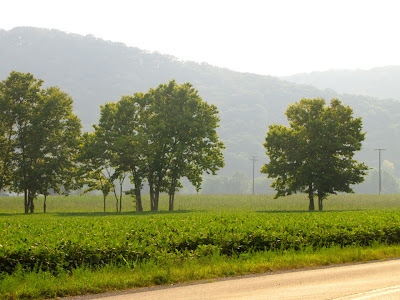 When we were traveling to the juggling festival last month and took an inadvertent detour, we drove through this countryside so I had to go back! At night I'm tired and don't care too much where I park and sleep, as long as it's safe. Travelers line themselves into rows in a corner of the Wal-Mart parking lot in Chillicothe. I'm last so I go to the back of the line. I didn't think sleeping in a car would be that comfortable at first! I have a Toyota Corolla station wagon and the back seats are folded down so there's a big flat surface. It's just big enough for me to stretch out diagonally. There's also room for a duffle bag and a tent and an as-yet unused sleeping bag and big jug of water. (Snacks, maps, cooler, and electronics are on the front seat.) The bed is made of stacks of foam pads, and on top is a thin sleeping pad like hikers use, and a sheet. That works about as good as I need. Probably the worst thing is you can't sit up, and it has windows! I can hang stuff in the windows if it gets too bright. On the plus side, it never leaks rain. 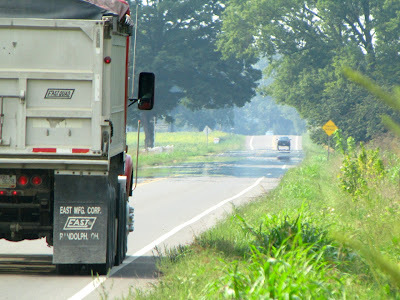 Here's a view looking back from the driver's seat. I can do work in the car on the laptop (using cellular internet and cigarette lighter). I try to find interesting parts of town to park in. I'm also on the lookout for free wi-fi and an outlet. One time my laptop saw a network near a donut shop. "We don't have internet cafes in Chillicothe" the lady almost proudly informed me when I strolled into her place with the laptop. Visions of gooey donuts faded. Then came an acute awareness of a collective gaze of rebuff from the customers. On my last day in town I eventually found free wi-fi at a local bar, which was strange because I couldn't imagine any of the customers bringing a laptop. 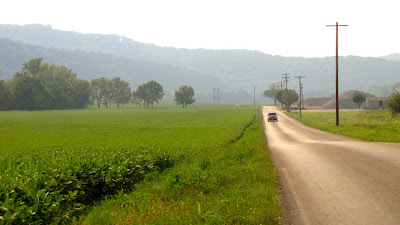 Friday I said goodbye to Chillicothe and got a tinge of excitement as I hit the road. 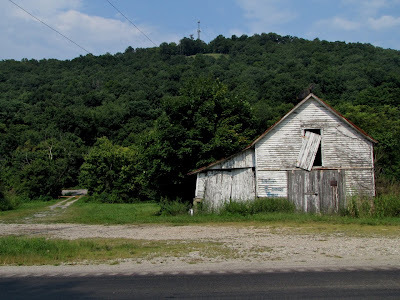 It seemed like kind of a depressed town, though not without its slight southern charm. I also was in dire need of a shower and was starting to feel homeless. Surprisingly I couldn't locate any truck stops without driving back to the Columbus area! I washed up in a men's room. You can get a sense for places with good restrooms, and sometimes you want to get something to drink or snack on there too. I drove on to Athens with plans to get a nice hotel room. But I didn't need a whole room and bed, just a shower. So I opted for a $26 camp site. It was a lot better than a Wal-Mart parking lot. The bathroom was grungy as expected but they had hot water and the next morning I got cleaned up! And it was nice to be outdoors. 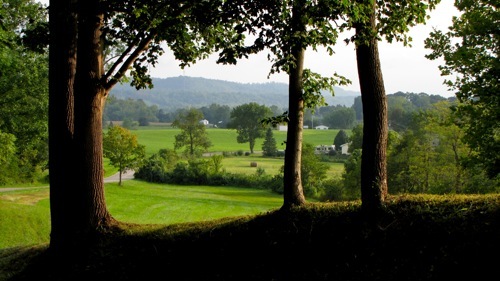 I really liked the first picture through the shaded tree area into a bright hilly landscape with vibrant greens. That would have been a perfect scene to use the polarizing filter. It may have cut through the haze and enhanced the sky. Same comment with some of the other scenes with too much blue in the distance. I tried to do some correction with photoshop but not possible to do much. Need some more sky detail for my taste. Have you tried bracketing your pictures with three exposure settings. These shots are so valuable as a one time chance. Did you use a tripod or comparable camera mount? Love the pictures! I love the first one the most. Great contrast, I want to put it on my wall! 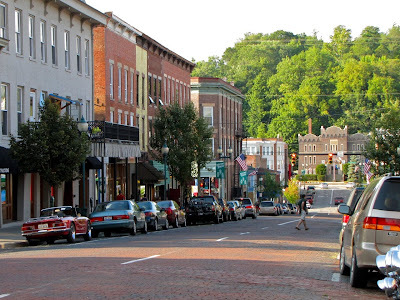 I hope you like Athens, it is one of my favorite places in Ohio. I am planning on a visit with the kids this fall. 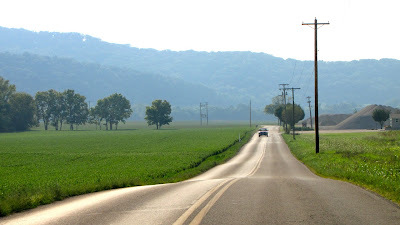 I look at those pictures, and I think of nice hilly bike riding!! Yay!! But Andy was right in the last post. You need a bike and a kayak next time! I didn't know so many folks slept in the wal-mart parking lot. It's a whole sub-culture that I was totally unaware of. 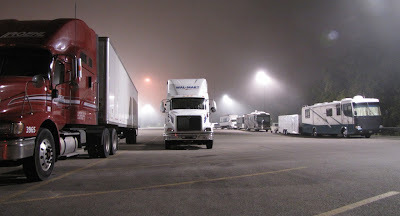 "I didn't know so many folks slept in the wal-mart parking lot. It's a whole sub-culture that I was totally unaware of." Right on! I smell a book! Wow Scott, integrating work & traveling has been lifelong dream :) How exciting! When I was 16 I did something similar - packed some stuff, grabbed a blanket and headed south for a week to come back up the Blue Ridge Parkway. The people were definitely nicer south of Ohio! The thing I did not expect or plan for was the Cold weather I experienced - very hard to fall asleep when you're freezing! Really enjoy seeing your pics - they are awesome!! Dad... I think I did use the polarizer and bracketing, except no tripod. The shutter was at 1/60 on ISO 80 which is probably fine with image stabilization. I had just cleaned the polarizer quickly and recalibrated it so I think it was on. It was just a hazy evening (storming up the road in Columbus). I had bracketing turned on most of the time... looking at the darker version of that image, that might actually be slightly less hazy! However there's sightly less light on the foreground trees. Regarding that sub-culture... 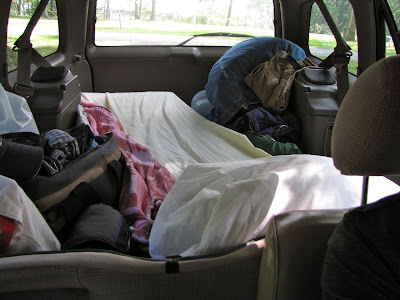 I've run into more than a few people with an old van or pickup with a cap, and when they go on a weekend trip someplace I imagine it's easy to just jump in the back when you get tired and sleep wherever you are! You can wake up with nature all around you and without the stress of finding lodging, checking in, paying for it, etc. Also easier than setting up and tearing down a tent each time. Sharon, I gotta hear your story about that trip! Great idea! Yeah, cold weather is something I'm trying to avoid. If it ever goes down below 50, I'll be piling on the blankets even with my sleeping bag!